I became close friends with Elisabeth Jordan as she sharpened the vision of The Human Impact and learned from first-hand experience what the people needed and what she, as the spearhead of The Human Impact, could do to provide a solution for basic needs. The need for community and long-term support network for people suffering from all kinds of illnesses was evident, as well as some more practical needs that could be provided through service or small donations. We began to ask people what they wanted from us instead of material goods. We did this because we realized that many organizations provide material goods. Often due to the nature of the situation, our friends were taking donations and selling them to get other things; sometimes these donations were sold, traded, or bartered to get things potentially detrimental to them. We asked people precisely what they wanted and we stopped assuming we knew what was best for them. Over the course of a few weeks, the most common answer we got was “haircuts,” and thus, the idea of Street-Side Salon was born. I did not think it was possible to put together a pop-up barber shop, but The Human Impact has people with impeccable creativity. After some brainstorming sessions, we figured out a way to get it done. During my first encounter with Street-Side Salon around four years ago, Elisabeth asked me to cut hair, and I did. I am no barber and we realized that in order to really give our friends a sense of restored dignity, it was necessary to provide them with the most talented, experienced barbers and stylists would could find. Over the course of a just a few years I watched the idea that was originally a thought develop into something that our people on the streets began to ask for regularly. Some of them even began to ask when specific barbers or stylists would be returning. Our original goal in this was to give people a makeover of sorts in hopes that it would give them enough confidence to apply for jobs in person. There are plenty of success stories to support our theory. To add to the community aspect of the event, we decided to incorporate a bread-breaking activity. 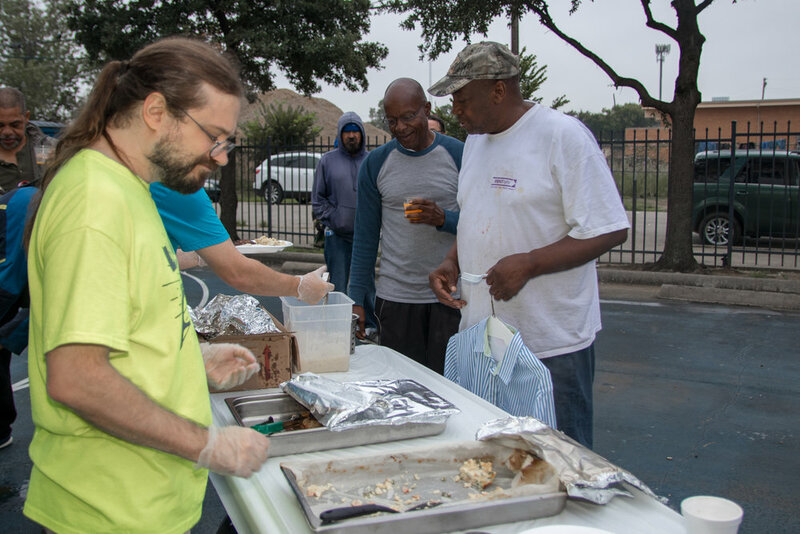 We served a meal and provided coffee which lead to conversation and connections that have been lasting. 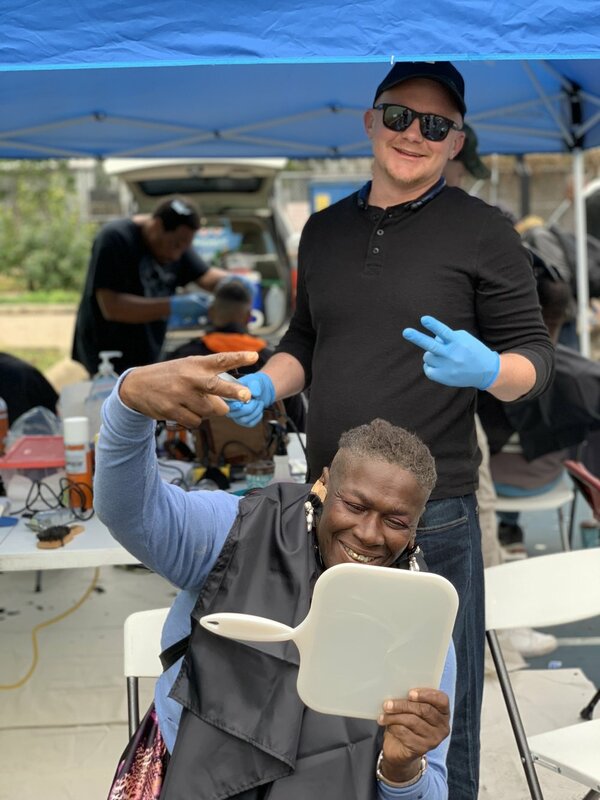 The Street-Side Salon movement has been a concept blessed by the Holy Spirit that requires much coordination and planning, but it has been something that we look forward to more and more. Our volunteers, donors, and advocates have been vital in continuing to provide the experience regularly and we could not do it without their help. We want to especially thank Austin Street Center who has, for the past year, allowed us to set up this pop-up shop on their basketball court.